I saw this post on Becky's blog and as Christmas is fast approaching, I thought I'd give it a try. It has to be 'Love Actually' I know that is so predictable and about 1000000 other people's favourites, but it's a classic! It's not Christmas until I've watched it. Christmas morning - always! Since we were little, my brother and I always wake up early, wait for our parents to get up and we all come downstairs wearing Santa hats, ready to open our presents! When we were younger, my parents would always put a piece of coal from the fire on the floor in the lounge to look like Santa had knocked it off on his way down the chimney and they'd leave a carrot top on the drive that Rudolph supposedly discarded, it really added to the magic of Christmas. Chocolate and Christmas dinner, minus the brussel sprouts! I've been so lucky over the years that I really can't think of one that I would be able to class as my favourite. One year I got a Robotic Dog which was THE present of the year and I know my grandparents had to hunt high and low to be able to get them for all the grandchildren. Christmas tree! Every year we get a real one and I don't feel like it's Christmas until I've smelt that scent. Both my parents normally work Christmas eve, so we don't really do much, but we always go to Midnight mass in the evening without fail, which is such a lovely service. A big glittery silver star and there's always arguments over who gets to put it on the tree! It's not that wild or extravagant, but I always wanted a TV for my bedroom, every year it would be on my list, but I was never allowed it! Spending time with my family. I have quite a large extended family and so we don't get to meet up very often, so Christmas is very special for all of us. I love the silly games that you can play at Christmas as it's always a guaranteed laugh. 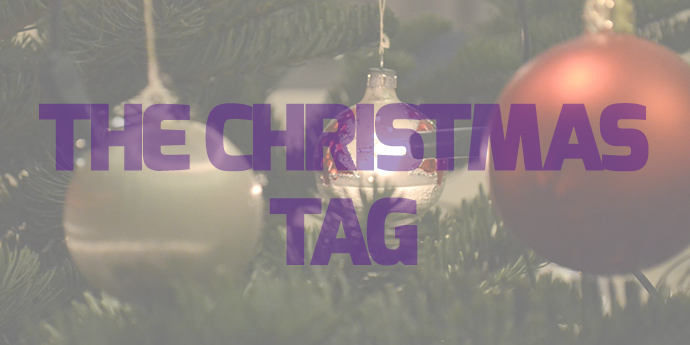 I tag anyone who hasn't done this tag yet - I'd love to see your responses.